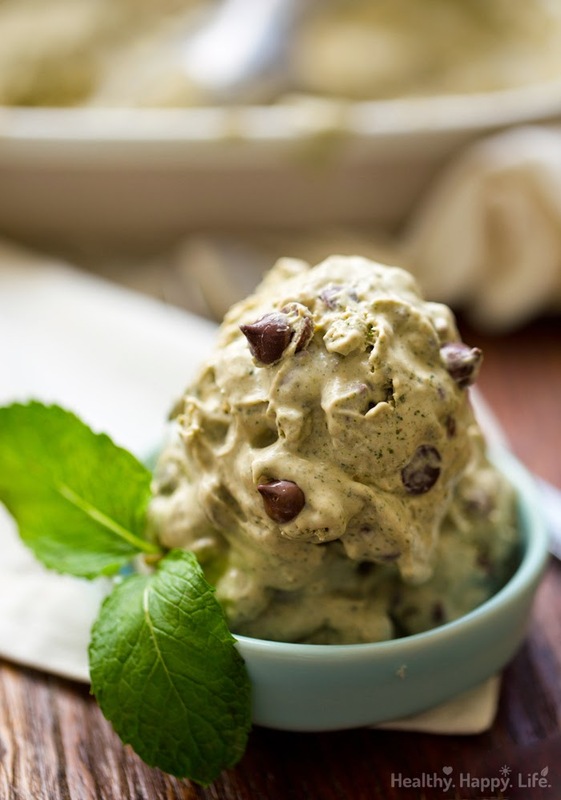 Mint Chocolate Chip Blender Ice Cream, made with Fresh Mint. Here is what I decided on. Recipe number one was a yummy summer berry fruit salad that I will be sharing in a few days. 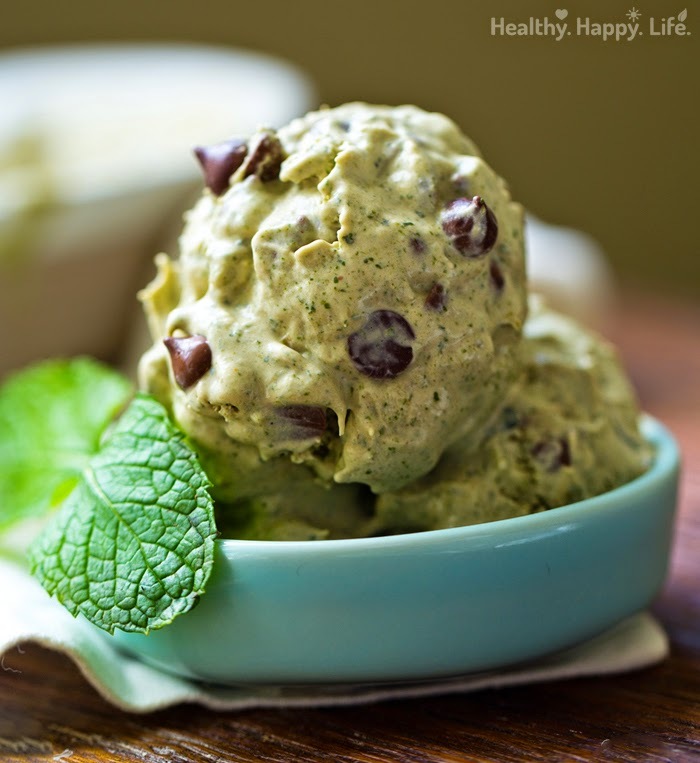 But first, I decided to take a chance at making my favorite creamy mint chocolate chip vegan ice cream, but instead of peppermint extract, I would use loads of fresh mint for the minty flavor and mild green color. Would this work? Why yes it did! 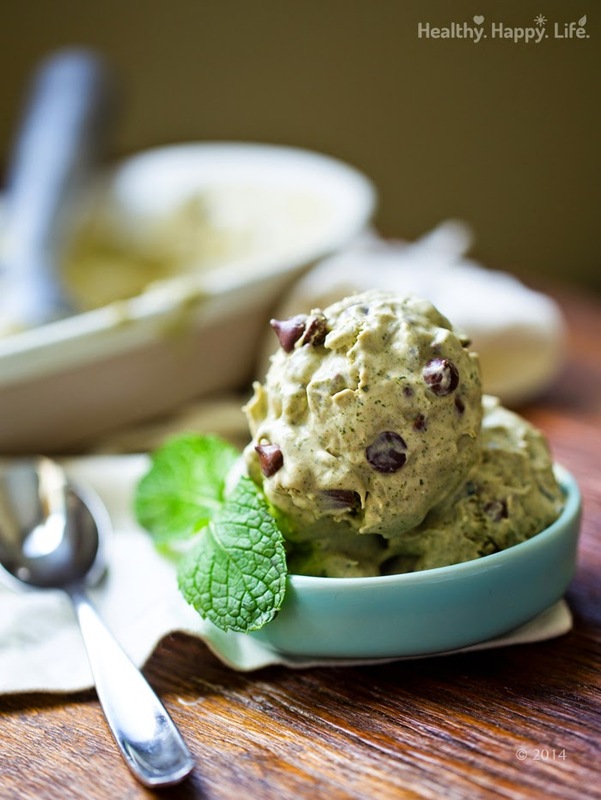 Pastel green color, creamy texture and a dairy-free status. This recipe has a very mellow sweetness that lets the fresh mint flavor shine through. 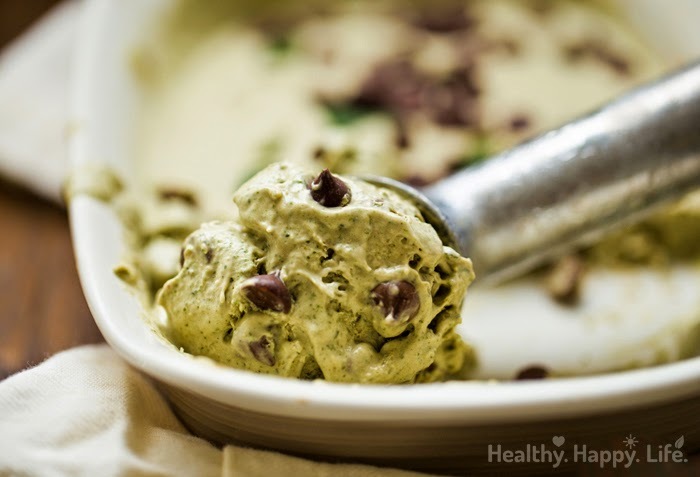 Grab some fresh mint from the store (or your garden .. lucky you), pull out your favorite dark chocolate chips and chill a can of coconut milk. We are making blender ice cream today!.. This is what Sochi feels like when he smells fresh mint. Cool. Relaxed. 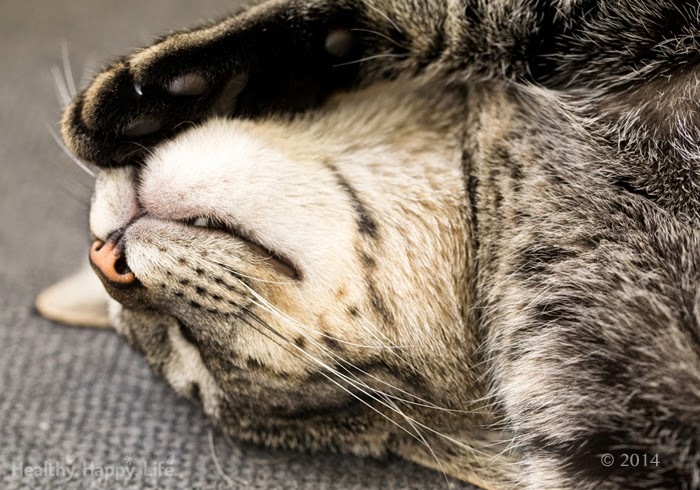 Drama-kitty. Did I mention that this ice cream is super creamy-amazing?.. (I am) Bananas for Bananas. I adore banana blender ice cream. It is a go-to recipe for me at all hours of the day. I always have bananas in my freezer, and I mean always. They are a staple in my kitchen and I use them most every single day. Peel the Love. If you are a banana fan like me, you may want to check out Dole's Peel the Love website and summer Cabana Tour, going on now. Check out my post here for details. Or head on over to Peel the Love for all the info and some fun recipes, banana inspiration and fun. The website looks like this, super fun..
What is it? Organized by DOLE® Bananas and co-sponsored by Blue Diamond Almond Breeze® Almondmilk,the two caravans are stopping at supermarkets, special events and other local venues to help you get banana inspired! Fun, whimsy and creativity galore. Tips for Fresh Mint Ice Cream. * Blend very well. You want the mint to be in tiny little specks, kind of how vanilla bean specks end up in real vanilla bean ice cream. * About Those Bananas. Make sure you freezer them when they are very ripe. Black-spotted. That means they will be sweeter and creamier. * Coconut Milk! Instead of using basic non-dairy milk (like soy or almond) as the liquid base, switch over to chilled coconut cream. Coconut cream is the "white stuff" that forms when you chill a can of coconut milk. Only use the cream part of the can for super rich, fluffy, amazing vegan ice cream. * Let it thaw! Let it Thaw! ..sung to the tune of Let it Go. That will help you remember a very important point when serving homemade coconut milk ice cream. Let it thaw. It will be rock hard just out of the freezer (if it chills too long) but give it a good 10-20 minutes and it will be perfectly cool, scoopable and creamy, melty bliss. So... "Let it thaw!..." * Guar Gum. Guar gum is totally, completely, 100% optional. BUT it does add a fluffiness that is quite appealing. If you check out the labels of most store-bought vegan and traditional ice creams, they use guar gum. It binds the ingredients a bit, adds some oomph, and thickens the creaminess. I add a very small amount, about 1/4 tsp for today's recipe. * Chilled container! Be sure to chill your ice cream freezing container ahead of time. This will help the ice cream mixture chill faster and have less iciness, more creaminess. I use either a stainless steel container, bread loaf pan or glass dishes. * Eat Soon. The fresh blender ice cream is best served the day you make it. The fresher the better for all things, including ice cream. * Sweeteners? You can use 100% frozen bananas to sweeten your ice cream, or use the splash of maple or agave syrup like in the recipe. I add a pinch of salt to enhance the natural sweetness of the ice cream. * Vanilla Bean. I think this ice cream tastes amazing with a hint of vanilla bean. * Secret Add-In. A secret for making blender ice cream frosty-amazing and lightened up: frozen watermelon cubes. Add a few to the blend. * More minty? If you like really strong mint flavor, you may want to add more fresh mint than I did. Or if you want to combine the subtle-ness of fresh mint with the boldness of peppermint extract, go for it, just a drop or two should do it. 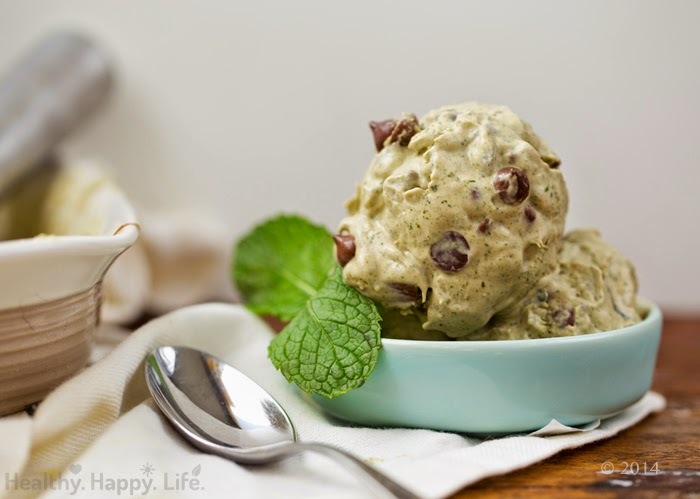 This cool and creamy blender ice cream uses fresh mint, dark chocolate chips, coconut milk cream and frozen bananas. Summer dessert to crave. This recipe has a very mellow sweetness that lets the fresh mint flavor shine through. In advance: Chill the coconut milk a day ahead of time. Place your ice cream chilling container in the freezer so that it is chilled when you pour the mixture into it. Open the can and spoon only the opaque white coconut cream into the blender. Also add the liquid sweetener, guar gum and fresh mint. Close the lid and blend from low to high until the mint has been blended into very tiny green specks and the coconut cream turns a light green color. Add in the bananas, vanilla, salt. Blend until the mixture is creamy and thickened from those frozen bananas. Finally, add the chocolate chips to the blender and pulse 2-3 times or more depending on if you want your chocolate chips whole or chopped. Pour the mixture into your chilled ice cream container. Place in the freezer. Check on the ice cream in 20 minutes intervals until it has chilled enough to scoop or serve as frozen soft serve. *As a banana-superfan I am happy to note that this post was sponsored by DOLE's Peel the Love Cabana Tour.